Release Date: October 27th, 2006 by Samuel Goldwyn Films. The Cast: Henry Czerny, Vilma Silva, Bruce Page, Abdul Salaam el Razzac, Zillah Glory, Ingrid Boulting, Joe Ivy, Michael Goorjian, Carolyn Hennesy, Jerry McGill, Ruth DeSosa. Directed by Stephen Simon. 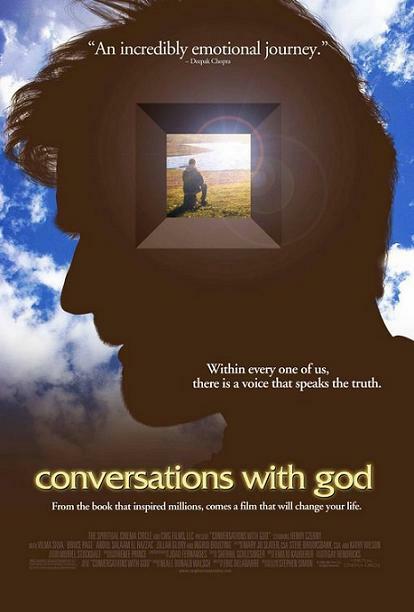 BASIC PREMISE: Neale Donald Walsh (Czerny) goes from riches-to-rags and then back to riches as an author of a spiritual book, Conversations with God, who literally communicates with God. ENTERTAINMENT VALUE: Henry Czerny plays Neale, a middle-aged man who loses every material possession all at once, including his job and home—on top of that, he gets injured from a car crash, so there goes his car as well. In now way is Czerny convincing as this Job-like character given how his sufferings seem too convoluted. He doesn’t even have a wife or friends to seek help from, other than an alcoholic homeless man he meets at a campsite for the homeless. Soon enough, God speaks to him in a voice that doesn’t sound God-like nor does He say anything that God might say—unless He’s reading from a Hallmark card. Neale answers an ad for a job at a radio station and, miraculously, gets the job but then loses it. Somehow, he managed to befriend the receptionist at the station who, miraculously, is willing to become his typist for the second volume of his book, Conversations with God. Will he become rich and famous? Will he forget his Christian values of generosity? Eric DelaBarre’s awful screenplay doesn’t allow you to care about the answers to those questions. Ultimately, Conversations with God feels like a direct-to-TV movie filled with mediocre to awful performances as well as many contrived and awkward scenes. INSULT TO YOUR INTELLIGENCE: Contrived, stilted and awkward. IN A NUTSHELL: Uninspiring, contrived, painfully stilted and awkward with mediocre performances at best.